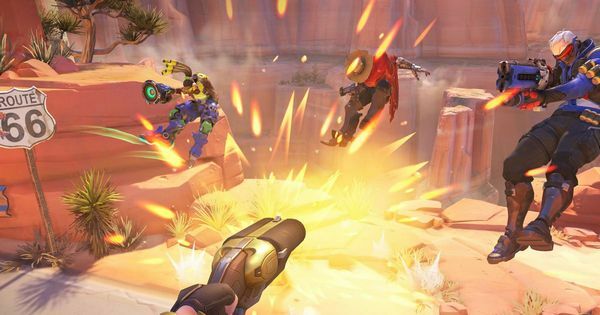 Home » Games » Meet the New Wild-West Waifu: Overwatch Ashe! Despite the general term used for all playable Overwatch characters is “Heroes”, not all of them are actual “heroes” if we think about it. In fact, a number of them are criminals (or former criminals, depending on how you put it) like Doomfist, Sombra. 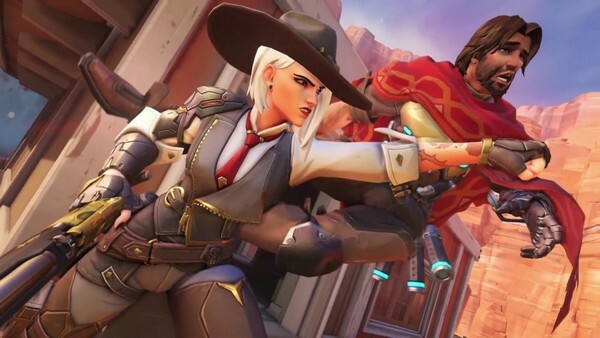 And this time, Overwatch fans get to see a new “bad-girl waifu”, who is also an old friend of our fan-favorite McCree, Ashe of the Deadlock Gang. So who is this Overwatch Ashe? How powerful is she? Let’s find out! 3. Overwatch Ashe: Is she good? For those who have seen the Overwatch animated-short “Reunion” from Blizzcon 2018, you probably have a general idea of who this girl is. According to her official bio, Ashe was born from a wealthy family filled with riches and privileges, thanks to her parents being renowned business consultants and coaches. Like any cliché rich-family type, Ashe’s parents did not pay much attention towards their child, while for most of the time she was under the care of the family’s Omnic butler – B.O.B. In return, they do trying to give her lots of chances to succeed; however, Ashe still could not find her passion until she met an outlaw named Jesse McCree, who was also a member of the infamous Deadlock Gang. Together, Ashe and McCree pulled a number of crimes and soon enough, she finally found her true passion of being a legendary outlaw. Thanks to her brilliant mind, Ashe along with the Deadlock Gang gained tons more fame with many stunning heists, making them comparable to even the most dangerous criminal organizations in the American Southwest. After years of conflict, Ashe called heads of major criminal groups together and established an order for the Southwest underworld thanks to her parents’ business teaching. And with all the conflicts were finally over, she can now focus on her true goal of making her name a legend among outlaws. 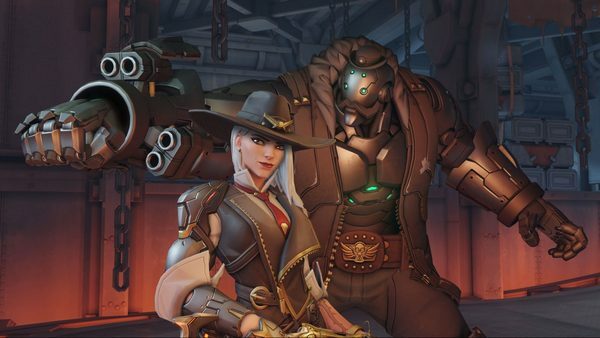 As we have already seen, while McCree chose to redeem himself and became a heroic member of the Overwatch, Ashe still prefers her old way and clearly, these two have a long history together. And of course, their fate has not ended yet… at least for now. In this mode, The Viper will quickly fire bullets at enemies, ideal for close-range combat. With the scope up, The Viper will fire more precise shot with higher damage. 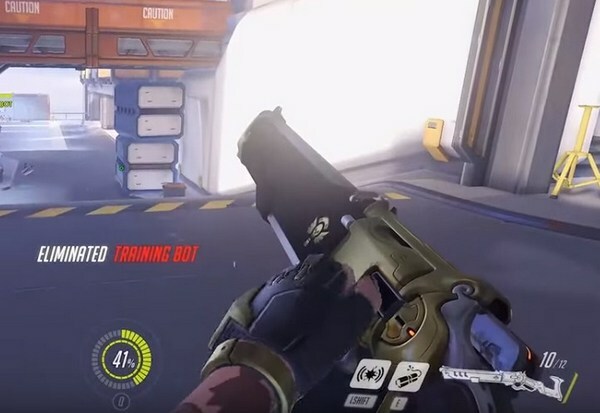 And while in this firing mode, Ashe’s movement speed will be reduced by 20%. One thing to note though, The Viper only reloads 1 bullet at a time, starting with 0.5 seconds for the initial reloading animation + 0.3 seconds per bullet, which means the gun requires 4.25 seconds in total to fully reload 12 bullets. And while this reload time is extremely slow, you don’t need to wait 4.25sec for the gun to fully reload. Instead, you can still cancel the reload and fire, and any bullets reloaded beforehand will still be in the gun. Also, you can hold primary fire key to shoot continuously and instead, you have to tap the key one at a time. This ability is fairly simple. 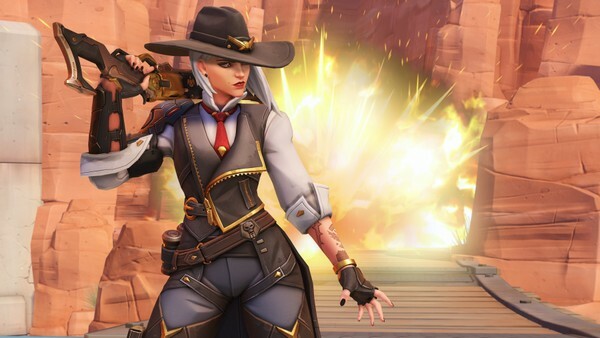 Ashe throws a dynamite which deals 30 – 75 damage during its explosion within an area of 5 meters (or 120 damage to armor). Enemy who catch up with the explosion also gets burned over 5sec, taking 100 damage in total. 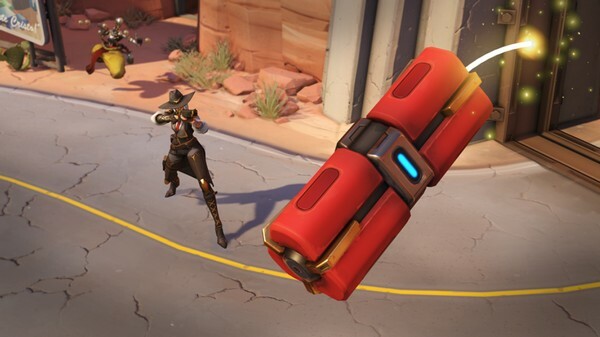 The dynamite still needs quite a while to actually explode; yet interesting enough, Ashe can fire the dynamite to make it detonate immediately. In addition, please be noted that Ashe can also get self-damage from her dynamite; however, she only receives half of the damage. 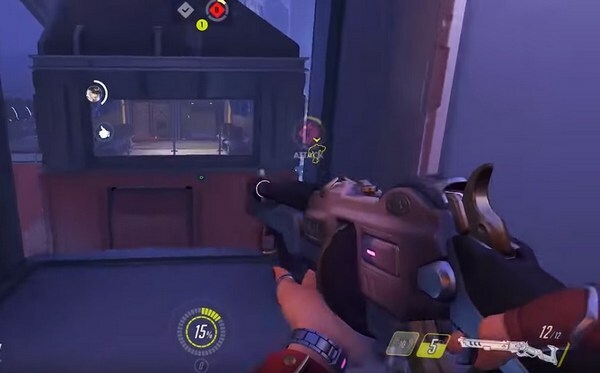 Aside from her Viper primary firearm, Ashe also has a Coach Gun side-arm which fires 15 pellets in total, each deal 6 damage, making up to 90 damage per shot. Despite its low damage, Coach Gun is actually not for dealing damage but rather, pushing her and the enemy back. This makes the ability to be extremely useful in distancing the enemy and movement maneuver. The mission of a butler is to serve its master, and this also applies to Ashe’s omnic butler B.O.B. When activated, Ashe will summon B.O.B to charge in her firing direction, dealing 120 damage. 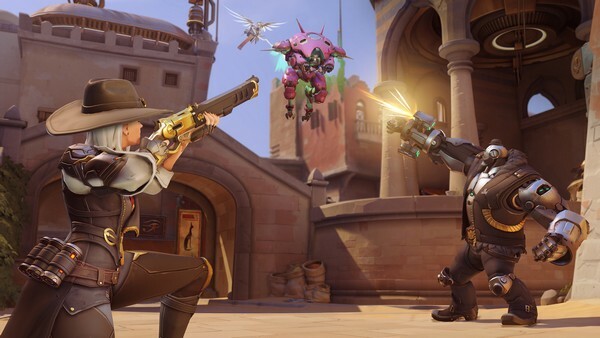 Not only that, B.O.B will actually keep on fighting as a secondary character and help Ashe dealing with the enemies for 10 seconds. 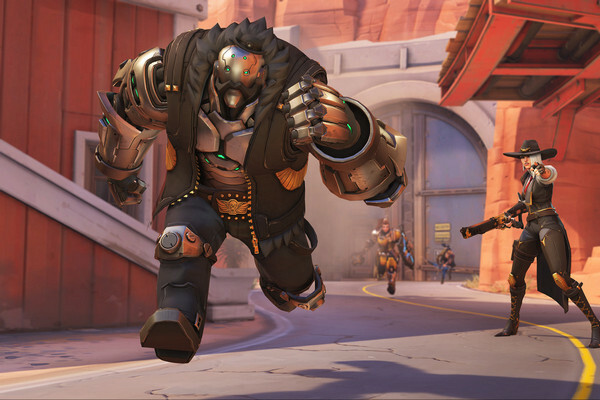 B.O.B is an extremely beefy bot with 1200 Health in total (not to mention that he can be healed), plus he can deal an insane amount of damage via his Arm Cannon. As mentioned, Ashe is a mid-ranged hero character who seems to focus more on sniping enemy from afar and staying away from nearby enemies. Her primary firearm – The Viper – is really good at this aspect thanks to its precise shot and clear scope; however, its damage is only average at best. More importantly, The Viper has a rather slow reload time since it only replenishes 1 bullet at a time. This may not be much of deal (or beneficial even) when sniping from a far, but in closer fight, it will be huge problem for Ashe. Even if she uses automatic fire, Ashe can still be in hell of an issue if she cannot kill the enemy after firing all 12 bullets. That said though, Ashe can still get away from tricky situation by using Coach Gun. And again despite the low damage, its true benefit comes from the knock-back effect which pushes both Ashe and her enemy behind. Even better, Coach Gun can push Ashe away even if it does not hit any target. This makes it a splendid maneuver tool for Ashe, allowing her to launch herself to the sky, or, launching her to high grounds. The only downside of this ability is its 10-sec cooldown, which means Ashe users will have to use it wisely if they don’t want to be stuck in tricky situation while having nothing to run. Ashe’s other damage-dealing ability is Dynamite which is splendid for dealing AOE periodical damage to the opponents. The best thing about Dynamite is that it can detonate quickly if gets hit. 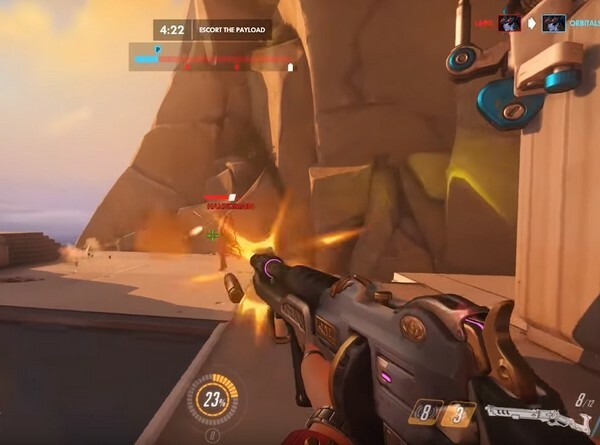 This allows Ashe to pull off some nice tricks of shooting/throwing dynamite at a group of enemies or, try out “suicidal stunt” of blowing herself and closing-in enemy (she takes half of the Dynamite’s damage anyway). Finally we have B.O.B which is an insanely powerful tanking robot. Not only it has high health-pool, it also has rather high damage, making it a crazy machine. In many cases, B.O.B can be a life-saver as he always rams the target far away from Ashe. Not only that, B.O.B is surprisingly useful as he actively attacks the nearby enemies after the initial charge. He can cover quite far distance, he even jumps from one building to the other to attack spotted enemy. And if the opponent wants to deal with him, it will not be an easy task given his beefy nature and furthermore, it will be highly risky as the opponent will leave themselves vulnerable to our allies. That being said, let’s remind us all that B.O.B is an ultimate ability. He only fights for 10sec and therefore, we cannot soly rely on him for most of the time. So far, we can say that Ashe requires quite time to master. 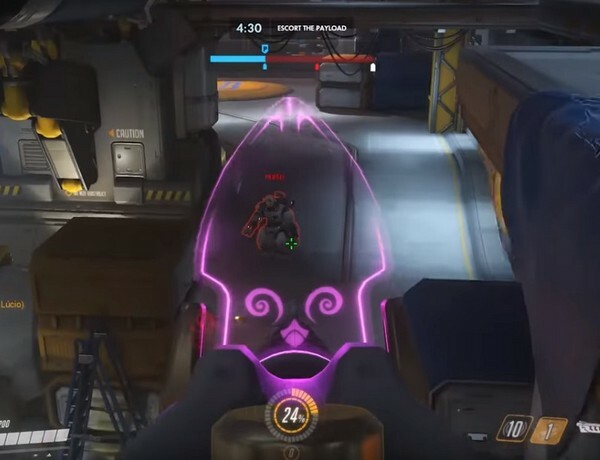 Despite having quite great attack range, Ashe relies a lot on sniping skill in order to land headshot for maximum damage. Otherwise, her Viper’s damage is not exactly that powerful and new players will definitely have a hard time controlling Ashe. On the other hand, Ashe is also a sort of “skill-based” character. To be more specific, most of her abilities rely on how well the players can utilize them. For example, Coach Gun is a great skill to push enemy away from her but it can also be a great skill for dodging and moving around. Yet its 10sec cooldown means players will have to know when to use it wisely. Then there is Dynamite which relies a lot of players’ timing and shooting skill. Dynamite will not explode right away after being thrown and it requires players to shoot at it to detonate immediately. And even so, it requires quite a certain playing time to finally get used to the skill. With all that said, Ashe is extremely fun to play with when we get used to her playstyle. Whether she needs buffs in future patches or not, it is hard to say for sure at the moment. Nonetheless, if you like hopping around, sniping enemies, and bashing them along with trust robot, Ashe is definitely a hero worth mastering. And that’s it folks! What do you think about Overwatch Ashe? Feel free to share with us and for now, thank you and stay tune for more news in the future! Call of Duty Black Ops 4: What we know so far!